Imagine is a 2hr professionally produced ice show at JDF Arena transformed into a theatre like setting. Experience spectacular lighting, sound, choreography, set and costume design. 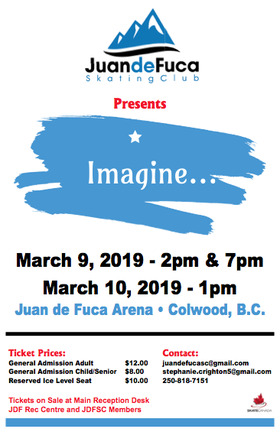 One of British Columbia's and Victoria's largest and best ice shows of the year is suitable for all ages. Imagine the British rock invasion of the 60's, under the sea or in New York City. Just some of the imaginative places we go. Come and let your imagination run wild!